Honeybees have facinating eyes : all five of them. Two compound eyes on either side of their head, and 3 “extra” eyes on top. That’s a bit antropromorphic, we humans think of two eyes as being “normal”, but for most in the Hymenoptera order five eyes is pretty normal. Two compound eyes can be seen on either side of honeybees’ heads. You must look a lot closer to see the three small eyes, the ocelli, that lie between their antennaes on the top of their head. This blog post is about the structure of those eyes and the purpose those eyes serve. A previous blog, What Colors Do Bees See,is about how they see color (and painting bee boxes). We can all see the large compound eyes on bees, especially on drones. Each of these compound eyes has 6,900 tiny lenses called facets. Each of these tiny lenses has its own photosensitive cells. The facets are in groups, each with a special skill : patterns, polarized light, colors, motion. There are 150 of these groups, called ommatidia, in each eye. Every ommatidia is connected to the optic nerve, and each one has 46 facets (by my math). The images from the thousands of lenses join together in the honeybee’s brain. Bees have excellent detection of color, polarized light and motion. But seeing outlines and forms is not a strong point. The resulting image from all those facets in their compound eyes is believed to be like a mosaic. Bees’ color perception is different from ours. They can see into the ultraviolet range, but to them, red is black. Honeybees are far better than we are at detecting motion. They apparently can detect a motion that happens in 1/300th of a second. If a movement takes 1/300th of a second, a bee can see the beginning and end of that movement. We humans would never see it. For us to register motion a movement must take longer than 1/50th of a second. A field of flowers or the blossoms of a tree may look still to us, but to the bees, those flowers are moving. Also assiting in navigation are tiny, sensitive hairs which grow where ever the facets meet. Honeybee navigation is further assisted by the three “simple” eyes are located in a triangular pattern between the honeybees’ annentae. “Simple” here is not just a description, it is a technical term. Simple eyes are also called ocelli (occellus is Latin for “little eye” according to Wikipedia). Each eye has only one lens. Their only purpose – but a vitally important one – is to allow the bees to use sunlight for navigation. The five eyes of a honeybee allow it to navigate its foraging area even on the cloudiest days and find its way home again. They allow each bee to see motion and color far beyond what any human can detect. All of the above has very little to do with beekeeping. But I think it’s interesting. Far more interesting than writing about winter chores in a northwest Washington beeyard: clearing blackberries, cutting shrubs, pulling up fifteen-foot alders, and leveling a small hill to enlarge the farm’s bee yard – all done in damp, subzero temperatures. I admit, I’m pretty proud about leveling the little hill with my 1966 tractor. In the photo, I put the pups in the middle of the area for scale. 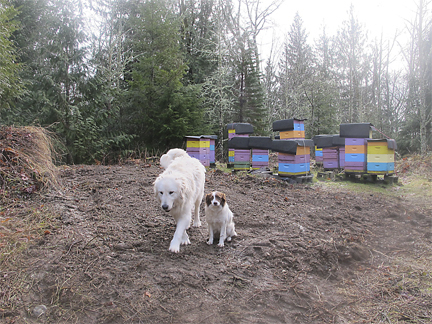 The big puppy (2 years old), is a livestock guard dog , without whom beekeeping would be nearly impossible due to the bears with whom we share our land. The little one is our “first alert” system. That’s the news from Brookfield Farm Bees And Honey in Maple Falls, Washington. Any comments and additional information about the amazing eyes of honeybees would be welcome. Life : an on-going learning experience for all of us. This entry was posted in Honeybees -interesting stuff and tagged bees, Brookfield Farm, compound, eyes, honeybees, Maple Falls, ocelli, simple, Washington. Bookmark the permalink.